It was Superman-esque, as Josh Beckett ripped off his uniform top in the dugout, then stalked over to the steps that lead to the tunnel to the clubhouse. Except there was no saving to be done. Beckett, in fact, had left his team with a very messy situation, and himself with a very early shower. He hasn't been himself - at least the 2007 version - all year, but yesterday's game took matters to extremes. Beckett lasted just 2 1/3 innings before Terry Francona emerged from the dugout and headed in his direction. The manager reached the mound in time to have a particularly lengthy conversation, one that ended with Beckett walking off the field, headed for a seat on the bench with an expression of frustration. But Beckett was not alone. For the second time in this abbreviated five-game homestand the bullpen fell apart. And, unlike last Tuesday night, the Red Sox' offense was unable to rescue its pitching staff with an outburst of its own. Instead the Sox fell, 15-4, swept in two games by the Blue Jays, against whom the Sox are 2-6 this season. Not exactly the way Boston wanted to head out on a nine-game road trip. "Whew. That was a bad day," Francona said, referring to Beckett. He could have been referring to the entire team, including a bullpen that allowed 17 runs on the homestand. That's not usually a way to win games, but the Sox managed to sweep the pitching-poor Rangers on their way to a 3-2 record between road trips. The Sox weren't doing much against a laboring Shaun Marcum, who lasted just five innings even having been given an 8-0 lead after three. And, as the runs mounted for the Blue Jays, and the Sox continued turning off to the dugout before reaching first base, the crowd of 37,415 began dispersing. The Sox had their chances, but didn't do enough damage. Even a bases-loaded, one-out situation in the fourth didn't help, as Jason Varitek grounded into a double play. "It's very tough, you're kind of just trying to finish it out, trying to get a couple guys on, stay within yourself," Jason Bay said about getting through a game that spirals out of control early. "But easier said than done without that atmosphere, without that little extra edge. But that's part of being a professional baseball player, trying to maintain and do that through the good and the bad times." Still, it was Beckett on whom the Sox' hopes were pinned, the team's nominal ace having shown glimpses of his greatness in his last two outings, a 6 2/3-inning win over the Royals Aug. 5, and an 8-inning, one-run mastery of the White Sox last Monday. "Especially after his last outing, very [surprising]," Varitek said. "He was really good his last outing. Just one of those days. Those guys sometimes looked in the right spot, sometimes looked at the right pitch, and got just the good enough one to hit at the right times. It was one of those days. Josh hasn't had one of those days. "Is this going to ruin Josh for the year? No." It was his shortest outing since a 1 1/3-inning blasting at Yankee Stadium June 5, 2006, in which he allowed seven earned runs. But there clearly has been something off about Beckett all season. While last year he contended for a Cy Young award, allowing just 73 earned runs in 200 2/3 innings, he already has given up 72 earned runs in 149 1/3 innings this season. Once Beckett got the first out of the game, a strikeout swinging of Joe Inglett on a 96 mile per hour fastball, the next six batters reached base on four hits, one walk, and one hit batter. And that should have been it. He should have been out of the inning on a grounder to first by Brad Wilkerson, which would have left Beckett just four runs in the hole, but Kevin Youkilis bobbled it and got just one out. That was followed by a two-run double by John McDonald in a 36-pitch first inning. Two more came in the third, on a home run by Adam Lind, and a triple by Wilkerson, though that was given up by David Aardsma. While Beckett had been throwing breaking balls that weren't breaking and fastballs without movement (except in the opposite direction), the bullpen was no better. It allowed seven more runs, with the Blue Jays tagging five of the six relievers sent out. It was a corps that included one unexpected name, as Clay Buchholz joined the parade, today's bullpen session turned into an inning (one run allowed) in yesterday's game. 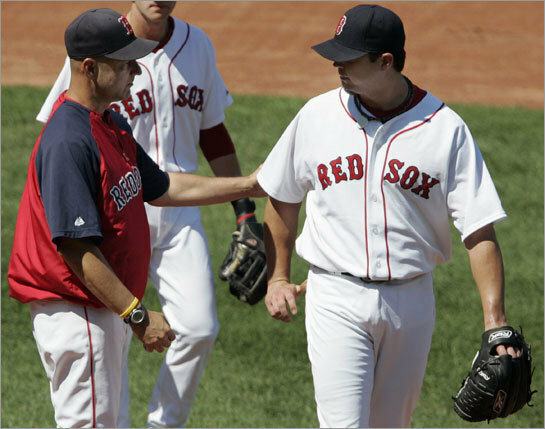 "Guys start playing games, they start guessing, and then they're guessing right," Varitek said. "Or they don't and you misfire, you make the wrong pitch. When a lot of success has gone on offensively it allows you to play the game a little. Be patient, be smart. Do those things. We made some mistakes and we made some good pitches, and they did some good hitting." So the Sox head out on the road with an inconsistent bullpen and an up-and-down ace. It is the team's final lengthy trip of the season (three cities, nine games), one that heads through three division opponents, starting in Baltimore, heading to Toronto, and then to New York. For a team attempting to close the gap with the Rays in the East, and one with a 28-35 road record, that is no small undertaking. "It's going to say a lot," Bay said. "It's going to be a big test, especially with the road record. We've got to find a way to win games that aren't here at Fenway. You have to do that. You can't just keeping winning games at home. You've got to find a way to win them on the road."